In the discussion about VWAP in [thread=1990]Part II,[/thread] we introduced the concept of skew, a measure of how the volume distibution deviates from a symmetric or normal distribution. The sign of the skew allowed a new trader to decide in which direction he/she should look for a trade setup. Positive skew meant look for long trades only. Negative skew meant look for short trades only. We have yet to consider trading aspects in markets with symmetric distributions. Like breakout trades discussed in [thread=2232]part VII,[/thread] trading symmetric distibutions is an advanced concept. Not for newbies to be dabbling in. Skew = (VWAP-PVP)/SD ~= 0. 2)Given a small or zero skew, it means that price action has moved across the VWAP at least once, otherwise the volume distibution could not be symmetric. 3)If the distribution is to remain symmetric, it must continue to oscillate across the PVP and hence the VWAP. If price moves to the 1st or 2nd SD above the VWAP pull the trigger SHORT. WOW- that's completely opposite to everything you've been told in the last seven threads. Up until now, every trade was taken moving AWAY FROM THE VWAP. Now you have to learn to take trades moving TOWARD THE VWAP. To trade a symmetric distribution, everything you have learned in the preceding threads is turned upside down. To complicate the situation, the condition for a symmetric distribution is fuzzy. It's defined with skew approximately but not necessarily 0. There is also no guarantee that it will remain small. For example, suppose the skew is slightly positive and price action is around the 1st SD below the VWAP. You would look for long trades back toward the VWAP. But it is also possible for the price action to continue on down with the VWAP crossing the PVP and continuing on down. Like the breakout trade, trading a symmetric distribution has to be done with great care. By its very nature, a trade taken toward the VWAP in a symmetric distribution is a counter trend trade. For example, when price is below the VWAP, the trend is down as defined in Part II. If you trade toward the VWAP then, you are taking a long entry in a down trending market. Look at the first video and see if our trader can decide if the distribution is symmetric. Advice: If you want to counter trend trade in a symmetric distribution, use the Shapiro Effect discussed in post 16541 to decide on the entry. If the countertrend trade is taken at the 1st SD below the VWAP and the trade fails (price action drops below the 1st SD) you have two choices. 1)reverse the trade and take your profit at the 2nd SD or 2) hang on and scale in at the 2nd SD for the counter trend move back to the 1st SD. Our trader in the first video was so sure that he would not want to take a short trade. But now watch the second video and see what our trader thinks now. In the second video, our trader takes 3 trades, the first a standard breakout from the PVP area as discussed in [thread=2232]Part VII,[/thread] the second a counter trend trade, and the third in the trend direction after a retrace. The last two trades demonstrate the use of the Shapiro Effect when the distribution is symmetric. Clearly trading symmetric distributions is as difficult as trading breakouts. The choices can be quite contradictory. Getting really interesting now. I thought with all the questions you might not have time for this weeks lesson! Great stuff as usual. For anyone interested, I emailed Howard (Ensign Software) and asked that he program the SD (as Jerry pointed out, the VWAP is available as a DYO study). Unfortunately he declines citing other committments. I am not a programmer so I will look in Esignals code library and if I cannot find it there, I will find a programmer to do the work using that platform (efs).  I will try to make it available to all TL members. A couple of questions. Do you always like to see both conditions before considering a counter trend trade? (flat distribution & PVP aprox equal to the VWAP). I just wondered if there are other situations where a return to the mean/mode might be anticipated. Good question Nick. Short answer is there are other situations where reversion to the mean might occur. Example being a skew sign flip does do it sometimes. But other than that I don't know what else would. For anyone interested, I emailed Howard (Ensign Software) and asked that he program the SD (as Jerry pointed out, the VWAP is available as a DYO study). Unfortunately he declines citing other committments. I'm surprised at that Steve. Howard is usually receptive to DYO studies. Thanks JPERL I am going through the videos. at 1357/1412 Central and they both hit the 2nd SD! Went through the videos...very nicely done thank you for posting! 1) Your definition of trend is price in relationship to the VWAP. 2) PVP in relationship to the VWAP tells you what kind of distribution you are looking at. VWAP close to the PVP tells you we are currently in a symmetric distribution. If the above statements are correct, I have a couple of questions. to the current situation as the VWAP and PVP relationship can change in the future. A) If the VWAP is above PVP you should only be looking for longs (assuming that current bias stays the same). This is regardless of location of price. If price is above VWAP you are trading with trend. If price is below VWAP you are trading counter trend. B) If the VWAP is below PVP you should only be looking for shorts (assuming that current bias stays the same). This is regardless of location of price. If price is above VWAP you are trading counter trend. If the price is below VWAP you are trading with the trend. C) If the VWAP/PVP is close it is a big assumption that current bias stays the same unless price moves rapidly back towards the VWAP. So when in a symmetric distribution it seems to make sense to me that you would only trade at 2nd and 3rd SD's for safety reasons in expectation of a move back to VWAP. However, it must move quick or you will not continue to have VWAP/PVP close (symmetric distribution). Given the above, the first trade on the YM does not make sense to me. We are in a symmetric distribution, why short at the 1SD below VWAP expecting a move to 2SD. If you expect the symmetric distribution to hold, then you are not trading with that expectation. It is more probably to get a move back to VWAP and other side of distribution, then to extend further against the VWAP toward 2SD and 3SD. The only exception would be if you are expecting the VWAP to continue down below the PVP and quickly turn into a negative skew. 1) Trading a positive/negative skew (non-symmetric distribution) in direction of the trend (defined by relationship of price and VWAP) with risk tolerance and scaling in. This one makes sense to me. 2) Trading a breakout at PVP against the skew in a non-symmetric distribution in direction of the trend (defined by relationship of price and VWAP) without risk tolerance (using tight stops and quick breakeven) makes sense to me because you are trading against the skew (which could change in the future) but you are trading with the trend. 3) Trading a symmetric distribution (assuming it holds) at the 2nd and 3rd SD's with the expectation of a QUICK move back to the PVP or other side of the distribution. It does not make sense to me to take trades at the 1SD with the expectation of a further move away from PVP in this type of distribution. If you are expecting a skew to appear...seems it would be better to wait for the skew then take this type of trade. Now if you are trading for a reversion to the mean at 2nd SD with the expectation of a move back to PVP or other side of distribution then risk tolerance doesn't make as much sense to me because the move is going to have to happen quickly because skew will appear if it stays out there and especially if it starts to move against you out towards the 3rd SD. Then you are going to have to exit (can't reverse positions in between 2nd and 3rd SD I wouldn't think. So I would think you would want to use a tight stop not risk tolerance. This is approximately correct. You can get reversion to the mean in any environment including a skewed environment. 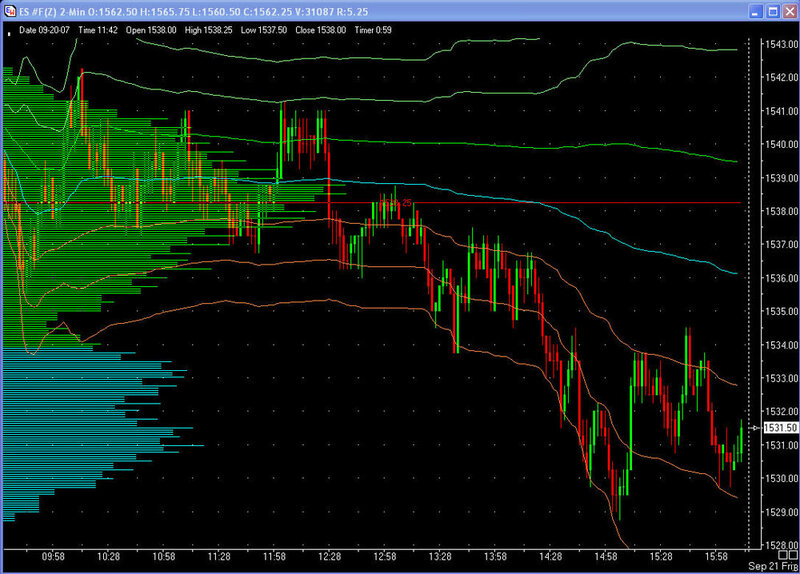 In a skewed environment you would look for a trade at the VWAP. In a non skewed symmetric environment, do nothing at the VWAP. Almost but not quite. You have to know where the price action is relative to the VWAP and PVP. For example for a positive skew your bias is long provided price action is above the VWAP. If price action is at or near the PVP, even if the skew is positive you don't have a bias until the breakout occurs. This is incorrect. Look for longs only when the price action is above the VWAP. 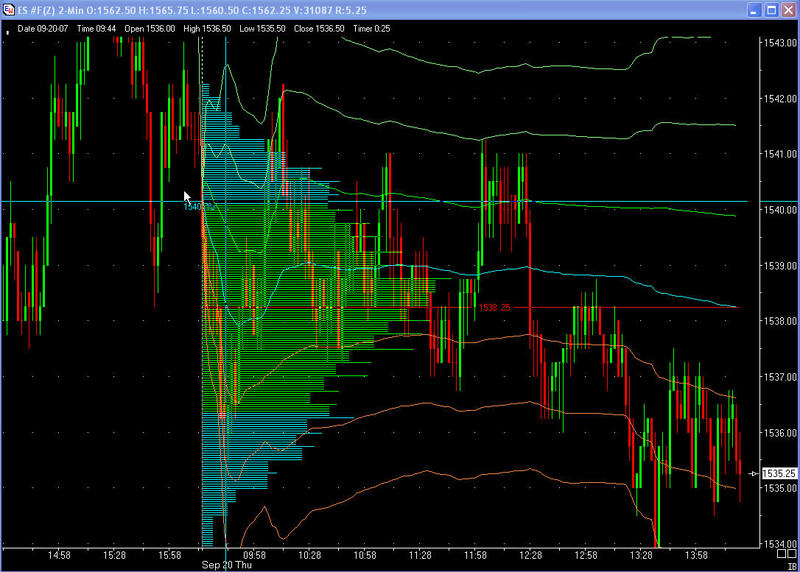 Below the VWAP, wait for the price to move above and retrace before taking a long. Otherwise wait for the break out at the SD below the PVP and go short. Also incorrect as mentioned above. You trade short if price is below the VWAP, otherwise wait for a breakout. You might want to reread [thread=2232]Part VII[/thread] concerning break out trades. C) If the VWAP/PVP is close it is a big assumption that current bias stays the same unless price moves rapidly back towards the VWAP. Don't know what you mean by current bias. If the skew is close to zero, there is no bias. So when in a symmetric distribution it seems to make sense to me that you would only trade at 2nd and 3rd SD's for safety reasons in expectation of a move back to VWAP. However, it must move quick or you will not continue to have VWAP/PVP close (symmetric distribution). Well this depends on your trading style. In a symmetric distribution you have a dilemma, in that you don't know how long the symmetry will last. This means you could take a trade at any of the SD's either long or short. In one case you would be trading countertrend, the other with the trend. That's why this is not for newbies. Using something like the Shapiro Effect will help. I think you meant the NQ video, the first video was a YM long. 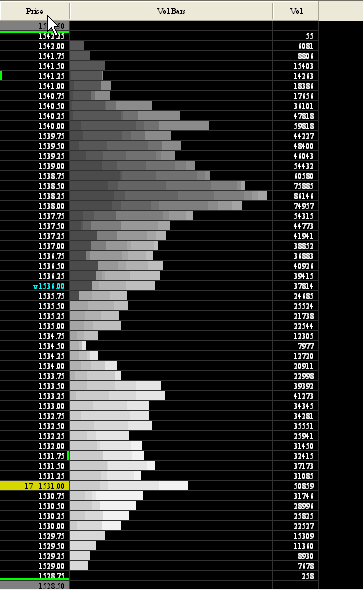 In any case the first NQ trade was a legitimate breakout trade into the low volume zone. It doesn't matter how close the VWAP is to the PVP, only that price action is in the PVP zone. Dangerous? yes, but nevertheless workable. 3) Trading a symmetric distribution (assuming it holds) at the 2nd and 3rd SD's with the expectation of a QUICK move back to the PVP or other side of the distribution. It does not make sense to me to take trades at the 1SD with the expectation of a further move away from PVP in this type of distribution. If you are expecting a skew to appear...seems it would be better to wait for the skew then take this type of trade. Again, this will depend on your trading style. An advanced trader would take the trade if he thinks the VWAP is going to continue on down. Why miss the opportunity? If the Shaprio effect indicated the price action is going to continue down, pull the trigger. Now if you are trading for a reversion to the mean at 2nd SD with the expectation of a move back to PVP or other side of distribution then risk tolerance doesn't make as much sense to me because the move is going to have to happen quickly because skew will appear if it stays out there and especially if it starts to move against you out towards the 3rd SD. Then you are going to have to exit (can't reverse positions in between 2nd and 3rd SD I wouldn't think. So I would think you would want to use a tight stop not risk tolerance. Yes, I would agree witht this interpretation. You would either exit the trade at a hard stop if the trade moved against you, or possibly reverse the trade for a further move down depending on how far below the 2nd SD you did the reversal. The VWAP/PVP relationship determines the type of distribution (skewed/symmetric). Ignoring for the moment that as price moves around and volume trades that the VWAP and PVP change and the distribution will probably change. Let's just say we were pretty sure that the type of distribution was not going to change for the next hour. The point I am trying to clear up is that price in relationship to VWAP determines trend. I don't think it does. I think the distribution function itself tells you the trend bias and strength based on the strength of the skew. Who cares where prices are in relationship to the VWAP. I am thinking in terms of statistics and occurences in relationship to the disribution function. If price is at the higher 2SD or 3SD or the lower 2SD or 3SD we would want to trade short or long with the expectation of prices moving back to the VWAP/PVP correct? The closer that price is to the VWAP/PVP the less of an edge we have....because price is where it should be in a symmetric distribution near the VWAP/PVP. So we definitely wouldn't want to take trades with the expectation of price moving away from VWAP/PVP towards 2SD/3SD or farther with the expectation of trending movement correct? Price location only tells us the edge we have and what we can expect to most likely occur within that distribution. The closer price is to VWAP/PVP the less of an edge we have and we don't want to take trades...the farther away from VWAP/PVP we are the better edge/opportunity we have to trade in direction of mean reversion toward the VWAP/PVP correct? Is this not indicating that we are in a trending type environment and we want to trade in the direction of the skew (assuming it doesn't change anytime soon)? So I should not care where price is only that it tells me the level of opportunity I have. If we have a positive skew I want to take any trade where price is at the PVP or lower! Because in a symmetric distribution I would fade a 2SD expecting a move back to VWAP/PVP. Even stronger in a postive skew...I am even more confident that it will move at least back to the VWAP and probably the upper 1/2 SD. In a negative skew just the opposite. It seems to me that the most important thing is the type of distribution you are in. In a positive skew environment I would think you wouldn't want to take any shorts period. And the same with no longs in a negative skew environment. In a symmetric distribution fade extremes on both sides. Of course this is not that easy because the distribution can flip/flop and the challenges that are associated with that. It seems to me that price in relationship to the VWAP is not much of a factor. The location of price within the type of distribution should be the driving force in my mind. The short question to all of this is why is the price in location to the VWAP so important and why is this the "trend"? Are there some statistics concepts that validate this? I am trying to reconcile all my math statistics classes I have taken with what I am reading. You are quite correct for static distribution functions. Note the emphasis on the word static. If you knew the distribution function in advance, you would know exactly how to trade it. As you correctly point out, if the distribution had positive skew, you would go long every time the price action dropped below the PVP and vice versa for negative skew. Similarly for no skew distribution, always trade toward the VWAP. This is the classical reversion to the mean theory. The problem as you realize, is that in a real market, the distribution function is dynamic. Note the emphasis on the word dynamic. Reversion to the mean, does not necessarily occur. Price action itself renormalizes the distribution as more prices are added to the time series. As a consequence, the relation of the price action to the VWAP and PVP becomes critical in choosing trade direction. Trading AWAY from the VWAP then becomes the more likely scenario. Trading TOWARD the VWAP is then relegated to symmetric distributions, which is the classical case. Trading away from the VWAP then defines the trend (if in fact you want or need a definition)as UP when the price action is above the VWAP and DOWN when the price action is below the VWAP. This definition breaks down of course when the distribution passes through the symmetric state. At that point there is no trend. Thanks a bunch...makes sense that the fact that it is dynamic it changes how you have to approach the distribution. Very interesting and it is starting to come together. Thanks to jperl for his generous insights, and dbntna and BlowFish for their work on theTradeStation code to see what is being discussed on the chart (received a copy from a trader on this board). Sorry for being dense on this, but I am a bit confused on the trade direction when viewing the Price vis-a-vis the VWAP and the PVP. My understanding is that the skew is in the direction of the VWAP (so VWAP > PVP means skew is up). When VWAP > PVP but current price < VWAP, is there a directional bias? Thanks for the threads and any clarification. The answer to your question emmster is a definite maybe. If the price action stays below the VWAP and breaks out below the 1st SD, then the bias would be down. But until that happens, all you will get are oscillations between the VWAP and the 1st SD below it. See the breakout thread [thread=2232]Part VII[/thread] for further clarification. Emmster despite following carefully at home I discovered something that I had missed. Skew and Trend can be quite different. I am not sure Jerry introduced the term 'bias' I think he has always talked about skew until others (like me ) mentioned it. Early on I chose to think of skew as a 'bias'. On reflection maybe that was not such a good idea. Might be easier to just think of skew (more volume above or below the PvP) i.e the distribution is skewed. And trend i.e. price is trading above or below the VWAP. In the basic trades skew and trend match things become trickier when they don't. Caveat - I'm still learning this stuff too so I hope I haven't given duff info. I am sure Jerry will correct me if I am mistaken. Thank you for the responses Jerry and BlowFish. I can see that I must be careful in the terminology I use because I may be introducing my own mental "bias" by using the wrong wording in my head when reviewing the posts. In ES Thurs, I see where skew and trend match, producing very nice outcomes. The idea of a breakout against the skew is also clearer on review and Jerry's comment above to dbntina - "the distribution function is dynamic. Note the emphasis on the word dynamic. Reversion to the mean, does not necessarily occur." 1.) Why not look to a longer time frame when trying to determine how long a distribution will remain symetric. I am thinking that following the skew on a daily and/or weekly basis might add value to the process. 2.) I have started to look for, and catalog "HUP's". Based on Jerry's characterization of them as places where price is held up while the market decides direction, I am keeping a list not only of the price but of the time (time and duration) to see if there is some utility to be had from that. Good points Steve. These two issues are related. I was going to do a thread on HUP but discovered that the presentation was too complicated. I'm still searching for a simple way to start it. was curious your thoughts on yesterdays volume distribution? it looked like a near perfect symmetrical distribution for much of the day then ended up building a fat lower tail. In situation like this, where you would expect to go long low in a symmetrical distribution (as it looked with an hour or two to go) -- but the distribution did not END UP symmetrical. curious your take? Sorry for the delay in getting back to you Dogpile. Just got back from China. In the first chart you can see that the skew is positive until 14:20 PM. So I would have been biased for breakout trades to the upside. There were quite a number of these that would have been good trades to the 1st and 2nd SD. Breakout trades to the downside would have all failed until 12:28 PM when the market broke out to the downside. It was only at 14:20 that the market became symmetric (PVP=VWAP at the last bar shown in the the first chart). As a trader you then had to decide whether to take an upside move back to the VWAP. Here is where the Shapiro Effect comes in handy. In the second chart which shows the whole day, there was no Shapiro effect to the upside after 14:20. In fact all the Shapiro effects occurred to the downside with good trade entries at 14:44, 14:58, 15:30 and 15:56. By 14:44 the skew went negative, so I would have only looked for short entries anyway. Too bad I had already left for China. It would have been a great trading day. thx jerry, welcome back. yes, 9/20 was a great trading day. Jerry do you pay much attention to the symmetry of the distribution? In particular I am thinking of taking a trade when the market is actually balanced but the distribution is still asymetric. Here is an example from today. To me long side seemed right even though the market was in balance. Interestingly the 2 minute chart showed +ve scue. The pvp seems quite sensitive to how the data is sampled. Funnily enough the slight smoothing you get by using say a 2 minute bar often seems to be helpful. Symmetric distributions (PVP ~= VWAP) are tough to trade especially when you have multiple peaks as in the example you show. My initital reaction would be to let it pass. Good point. Your probably more disciplined than me Jerry! As the old adage goes 'no position is a position'. I do find that sometimes I try and 'force' a trade particularly after missing a legitimate one (maybe just because I was doing something else) or for a variety of other reasons. When in doubt maybe it's wise to say 'what would newbie do' hehe. I've been following these treads with great interest and have been experimenting with different setups and I keep wondering a lot about one thing (among few others), which up to this point nobody has explained or inquired about. I was wondering if you or anyone else could elaborate on on my question. Why do you choose a "regular session" to start plotting your Volume Histogram and start calculations of PVP, vwap and SDs? I understand that majority of trades occur during regular session, and all institutions are then active, but statistically wouldn't it make more sense to include 24h of data? 3) Statistical data includes more samples - all trades that occurred. In theory that should give us more complete picture of the market and its more accurate interpretation. 2) VWAP and SDs are usually different from these generated at the beginning of the session, but not as dramatically as one would think. Interestingly, depending on the volatility the market prefers to use one set of VWAP and SDs over the other. 3) You will often have PVP and VWAP in a different relationship to each other, especially at the beginning of the session, and therefore you could read skew etc. differently. So wouldn't it seem logical to include all data available to us not just a partial sample, or how do we know that it is more beneficial to use to just use regular session data? "Statistics: The only science that enables different experts using the same figures to draw different conclusions." Thank you all again for running this thread. Date : 18th April 2019. MACRO EVENTS & NEWS OF 18th April 2019.FX News Today 10-year Treasury yields corrected -2.7 bp to 2.567% and JGB yields are down -1.4 bp at -0.0033%. Asian bonds were generally supported, as stock markets sentiment turned sour again, with South Korean paper underperforming after the BoK left interest rates unchanged, but cut its growth and inflation forecast to 2.5% and 1.1% respectively. Record household debt was one of the factors holding the BoK back from cutting rates for now, and South Korea’s 10-year yield jumped 5.9 bp as the bank tried to calm recession fears. Stock markets generally corrected from the six months high seen yesterday with uninspiring corporate earnings and problems with a new Samsung phone preventing further gains for now. Topix and Nikkei lost -0.96% and -0.80% respectively, after Wall Street closed with slight losses. The Hang Seng is down -0.58%, CSI 300 and Shanghai Comp down -0.44% and -0.39% respectively. The ASX dropped -0.10% and US stock futures are also broadly lower, suggesting ongoing pressure on markets. The front end WTI future meanwhile is trading at USD 63.77 per barrel. Charts of the Day Technician’s Corner EURUSD is still trading around the 1.13 level, and in a channel with key Resistance at 1.1320 and Support at 1.1279. Both are still strong after having bounced yesterday. Indicators are issuing mixed signals. GBPUSD has been stable around the 1.30 level, still unable to break through, fluctuating between the 1.3067-1.3026 Resistance and Support levels. Indicators are giving positive signals. USDJPY started the day below 112.00 mark, as indicators are suggesting a downwards movement. Support remains at 111.80. XAUUSD is trading at year-to-date lows, after breaking through the 1275 Support level. 1270 is the next Support level, with indicators are showing signs of stabilization. Main Macro Events Today EU PMIs (EUR, GMT 08:00) – Manufacturing and Composite PMIs are expected to increase in April, to 47.9 and 51.8 respectively while the Services PMI is forecasted to have remained at 53.3. Retail Sales ex Fuel (GBP, GMT 08:30) – UK Retail Sales ex Fuel are expected to have increased to 4% y/y, compared to 3.8% y/y in March. Retail Sales ex Autos (USD, GMT 12:30) – Retail Sales are expected to have increased to 0.4% in March, up from the negative 0.2% surprise in February. Retail Sales (CAD, GMT 12:30) – Retail Sales are forecasted to have registered an increase in Canada as well, to 0.2% compared to 0.1% in January. Philly Fed Index (USD, GMT 12:30) – Philly Fed index is expected to have eased to 10.3 compared to 13.7 in March. Markit PMIs (USD, GMT 13:45) – Mixed signals are expected from the PMI release, as Manufacturing is expected to have increased to 52.8 from 52.4, while the Services PMI is expected to have declined to 55 from 55.3. Support and ResistanceAlways trade with strict risk management. Your capital is the single most important aspect of your trading business.Please note that times displayed based on local time zone and are from time of writing this report.Click HERE to access the full HotForex Economic calendar.Want to learn to trade and analyse the markets? Join our webinars and get analysis and trading ideas combined with better understanding on how markets work. Click HERE to register for FREE!Click HERE to READ more Market news. Dr Nektarios Michail Market Analyst HotForex Disclaimer: This material is provided as a general marketing communication for information purposes only and does not constitute an independent investment research. Nothing in this communication contains, or should be considered as containing, an investment advice or an investment recommendation or a solicitation for the purpose of buying or selling of any financial instrument. All information provided is gathered from reputable sources and any information containing an indication of past performance is not a guarantee or reliable indicator of future performance. Users acknowledge that any investment in FX and CFDs products is characterized by a certain degree of uncertainty and that any investment of this nature involves a high level of risk for which the users are solely responsible and liable. We assume no liability for any loss arising from any investment made based on the information provided in this communication. This communication must not be reproduced or further distributed without our prior written permission. No trades for the 16th, actions for the 17th. I'm tying myself in knots watching the lowest time frames, it might be worthwhile watching higher time frames once the trade is open. Date : 17th April 2019. MACRO EVENTS & NEWS OF 17th April 2019. FX News Today * 10-year Treasury yields are up 0.7 bp at 2.598% and JGB yields climbed 1.8 bp to -0.015%, as stock market sentiment got a boost from Chinese data releases that beat expectations. * Chinese GDP growth came in at 6.4% y/y, in the first quarter, unchanged from Q4, while production surged 8.5% y/y and retail sales 8.7% y/y. * Data were taken as a sign that the government’s stimulus measures are starting to take effect. While it may be too early to call the all clear on the world economy, together with signs that US-Sino trade talks are making progress, * the data will go some way to bolster confidence, especially after positive surprises on credit and housing data last week. The data underpinned Asian stock markets, as Topix and Nikkei posted gains of 0.29% and 0.27% respectively. The Hang Seng is up 0.01% and CSI 400 and Shanghai Comp gained 0.11% and 0.34%. * Broader Asian indices are at the highest level since last July, even as the ASX underperformed and closed with a loss of -0.35%, dragged down by the materials sector. * US futures are also posting broad gains and the front end WTI future has moved up to now USD 64.50 per barrel. Charts of the Day Technician’s Corner * EURUSD moved past 1.13 early today and has been moving towards the 1.1315 Resistance level. Key Resistance remains at 1.1320 while the Support at 1.1279 is still strong after being hit twice yesterday. Indicators support an upwards move. * GBPUSD has been moving downwards but is so far unable to break through the psychological 1.30 level, fluctuating around the 1.3067-1.3026 levels. Indicators are giving mixed signals. * USDJPY found support again under the 112.00 mark, and continued to trade there yesterday, with the Japanese data releases causing only some volatility. Indicators are showing mixed signals. * XAUUSD is trading at lows, after breaking through the 1285 Support level. Gold appears unable to break through the 1275 level, with the MACD and Stochastics showing upwards signals. Main Macro Events Today * UK RPI and CPI inflation (GBP, GMT 08:30) – Both the RPI and the CPI are expected to have declined in March, reaching 2.1% and 1.6% respectively, down from 2.5% and 1.9% respectively. * EU CPI inflation (EUR, GMT 09:00) – Both the core and the overall CPI inflation rates are expected to have remained at the same levels, at 0.8% and 1.4% respectively. * Canada CPI Inflation (CAD, GMT 12:30) – The BoC Core price index is expected to have remained at 1.3% y/y, while the overall CPI index is forecast to rise to 1.9% y/y in March compared to 1.5% in February. Support and Resistance Levels Always trade with strict risk management. Your capital is the single most important aspect of your trading business. Please note that times displayed based on local time zone and are from time of writing this report. Click HERE to access the full HotForex Economic calendar. Want to learn to trade and analyse the markets? Join our webinars and get analysis and trading ideas combined with better understanding on how markets work. Click HERE to register for FREE! Click HERE to READ more Market news. Dr Nektarios Michail Market Analyst HotForex Disclaimer: This material is provided as a general marketing communication for information purposes only and does not constitute an independent investment research. Nothing in this communication contains, or should be considered as containing, an investment advice or an investment recommendation or a solicitation for the purpose of buying or selling of any financial instrument. All information provided is gathered from reputable sources and any information containing an indication of past performance is not a guarantee or reliable indicator of future performance. Users acknowledge that any investment in FX and CFDs products is characterized by a certain degree of uncertainty and that any investment of this nature involves a high level of risk for which the users are solely responsible and liable. We assume no liability for any loss arising from any investment made based on the information provided in this communication. This communication must not be reproduced or further distributed without our prior written permission.